If you are planning a family trip to Dublin, you might be wondering what are the top things to do in Dublin with kids. In this guide, we share our insider knowledge of the city to to help you find the best things to do in Dublin with children and practical tips to make the most of your time in the city as a family. I have been living in Dublin for over ten years and for more than half of this time, I have been here with my children. The Rabbit and the Bear, as I call them, are now respectively 6 and 8 and together we always try to explore our city with the same curiosity we show for far away places. Sometimes we go into town for a walk, sometimes we visit museums, some other times we just go to the park and stop for lunch out. Over the course of the years, we have discovered together many fun family things to do in Dublin with kids, and now I believe the time has come to put them into a mini guide for parents. So here it comes, my mini guide for families visiting Dublin with kids, packed with fun things to do in Dublin with children, family activities in Dublin, attractions and things to do in Dublin for kids and fun places for kids in Dublin. What are the top things to do in Dublin with kids? Dublin has many family friendly attractions: some are main sightseeing locations you can visit with kids and some and attraction that are specific for children. Let’s look more in details at each of these attractions and discover more things you can do in Dublin with kids. 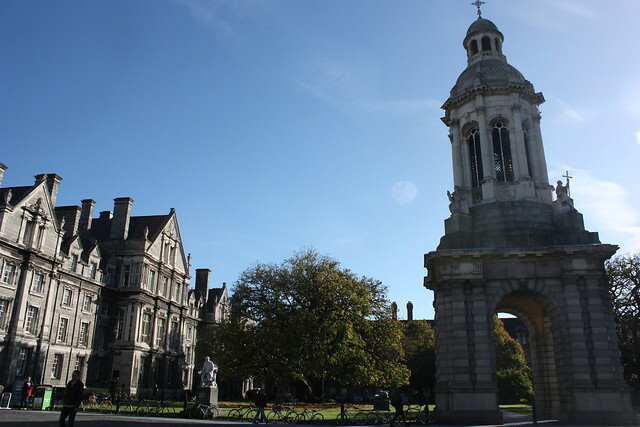 A historical and active University, Trinity College is a must see for all visitors both for its beautiful grounds and its historical library. Home of many important manuscripts and the famous Book of Kells, it is a good stop with children. It is a manageable size, it is impressive and if you have Star Wars lovers they will not miss the resemblance of its main library with the Jedi archive temple! Located in the city centre, this is a museum with skeletons and stuffed specimens of many species of animals, most of them preserved in the museum since the last century. I brought my kids there when they were tiny and the reaction was mixed: fascination and a bit of fear – some of the animals are immense! Entry is free. One of Dublin’s main museum and home of a wonderful Caravaggio, as well as of some interesting Irish paintings, the National Gallery enters this list because of good family friendly activities offered at the weekend and because of its cafeteria. Located on the ground floor, it is a popular spot for families with children as it is spacious, airy and buggy friendly. Entry to the National Gallery is free. The Chester Beatty Library is a beautiful museum in the grounds of Dublin castle. Home to fabulous collections of art from Asia, the Middle east and Europe, the Chester Beatty library is not interesting for children per se but has a lovely outside space perfect for running around. With no cars allowed, we often go there to let off steam and the free entry to the gallery means you can visit at your own pace. They also have a nice coffee and gift shop and facilities. 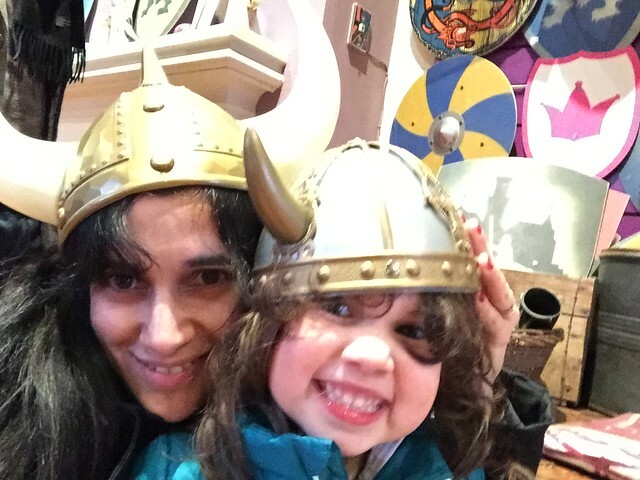 If your kids are into Vikings and history, this can be the most fun museum of all as it recreates the streets of Dublin as they would have been during the middle ages! For little children Imaginosity is a piece of heaven. Here you can play supermarket, doctor, rock star, you can drive a real car (kind of), build a house with foam bricks and even pretend to work at the post office. They also have soft play areas for children under 3 and a nice cafe. 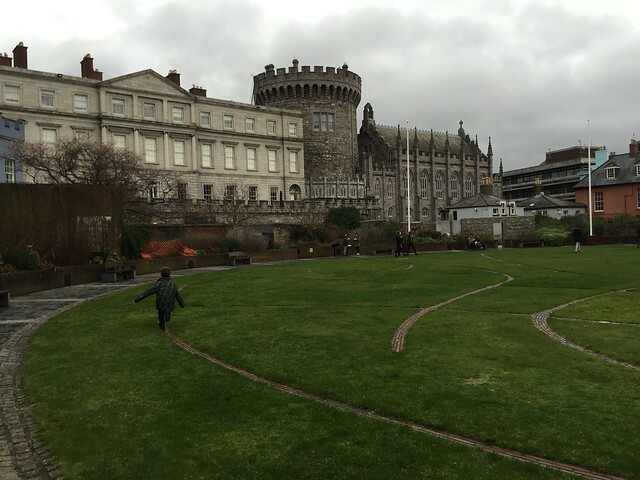 Outside of the city centre, you can reach it by the green Luas (tram line) and it is one of the most enjoyable things you can do in Dublin with kids on a rainy day. What’s a brewery doing in a list of attractions for families? While kids will not be allowed to taste Guinness, the visit to the factory is a fun tour accessible to buggies and very much enjoyed by teenagers as well as adults. When I worked for a school of English we used to bring all our students there and they always loved it: a well stocked merchandising shop and a fantastic view over Dublin from the gravity bar, where the visit ends, are strong reasons for that. If you are over 18, you’ll have there the best pint of Guinness in the world. With caution, I am including Kilmainham gaol into this list, as suitable and interesting for families with older kids (teenagers). A place like no other to learn about Irish history, it’s a chilling site and one younger kids might find disturbing, but an incredible insight into the dramatic and complex history of Ireland. Dublin has some wonderful parks: St Stephen’s green and Merrion square are lovely green spaces with beautiful playgrounds right in the centre of town and Phoenix park has deer roaming freely and hosts Dublin zoo. Outside of the centre, Bushy park and Marley Park are among my favourite hang outs at the weekend as they have nice playgrounds and a lovely farmers market. Marley park also hosts a small train ride that is super popular with kids! Nearby, it is worth visiting St Enda’s park, which also hosts the Pierce Museum. 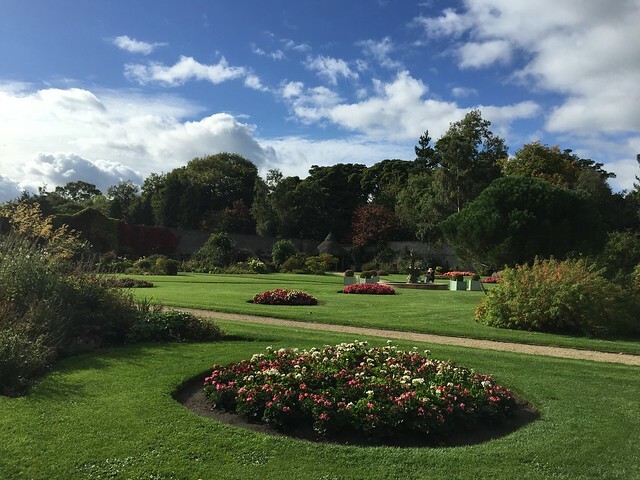 Howth and Blackrock also have some wonderful green spaces and St Anne’s park, in the North of Dublin, is a fantastic place for a day out and often hosts family fun days with entertainers and fun for all ages. One of the reasons why Dublin parks are so beautiful is the copious amount of rain they get, so it is worth noting down some indoor play alternatives should the weather not be on your side! A fun way to experience Dublin and cover grounds without getting kids overtired is to join the city hop on hop off bus tour. It is handy if visiting attractions slightly removed from the city centre and it is on a double-decker open top bus, which is fun for transport loving kids! If you want to mix mobility with a bit of fun, the best tour for you is the Viking splash tour. One of the most fun things to do in Dublin with children? Play Vikings! This tour brings you around the city in an amphibian ‘machine’ that will wheel you through the streets of Dublin and then dive into the river Liffey! Go with a good dose of self-irony as you will be offered to wear Viking horns: laughter and fun are guaranteed. Dublin has some beautiful surrounding and if you have more than a couple of days it’s worth stretching outside the main city centre area. Some of my favourite places are the botanical gardens, the coast (Howth and Malahide in the north of the bay and Dun Laoghaire and Dalkey in the south), Dundrum shopping centre and, almost beside it, Airfield farm, a working farm in the city. The best way to visit Dublin is on foot, but the city has a good public transport system including buses, tram (the luas) and urban light rail (the dart). Tickets for the bus can be bought on board while the ones for the tram and train are sold at vending machines at the respective stops. Small children go free. One word of warning about the bus: while technically accessible, buses often do not allow more than one wheelchair user/buggy on board at any given time (due to perceived lack of space). The safest and most convenient area of Dublin, location wise, is the city centre around St Stephens green. Tried and tested family friendly address in Dublin city centre that are sure to surround you with elegance and comfort are the Merrion Hotel (right in the city centre and with extra touches specific for little guests such as special junior room service menu served on bespoke Miss and Master Merrion crockery, mocktails and mini bathrobes to access the spa) and the Clayton hotel Ballsbridge, offering special family rooms and equipped with a handy restaurant onsite welcoming to kids. 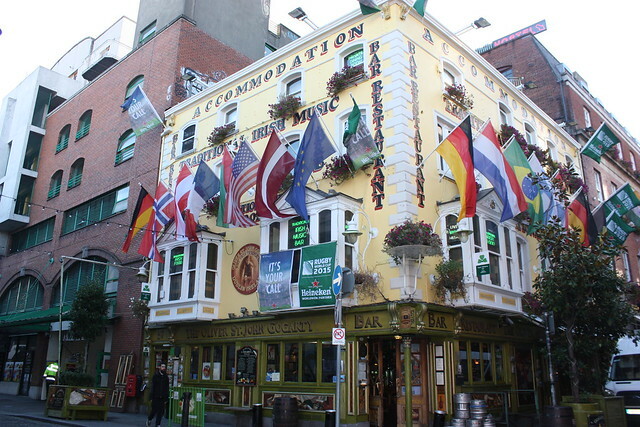 For a comprehensive list of accommodation options in Dublin, you can also check my full guide to the best areas to stay in Dublin with children with all my favorite hotels. 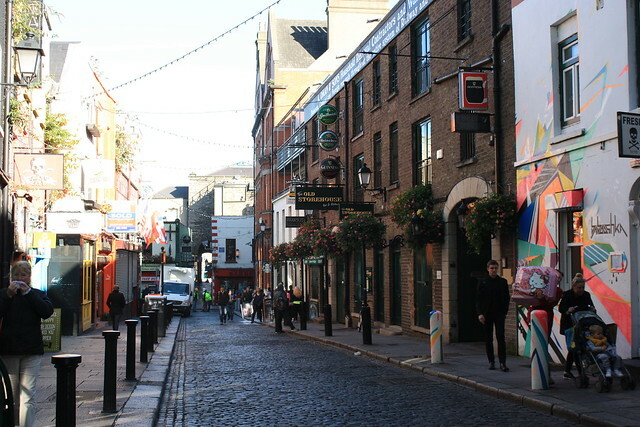 Dublin is often used as a base to visit the rest of Ireland and the area just around the city is often overlooked in favour of the wilder west. Nonetheless, there are some great day trips you can take from here, particularly pleasant especially if with young children. Greenan Maze, and the Japanese gardens in Co Kildare. It is always difficult to wrap up a post about your current city, but after almost 2000 words I probably need to accept I will never feel I included all I wanted to include and trust I wrote enough to give you some ideas on what to do in Dubiln fair city. I hope you found this family guide to Dublin useful. Safe family travels! Disclaimer: This post contains affiliate links. If you click on them and make a purchase, I will receive a small commission, at no extra cost to you.